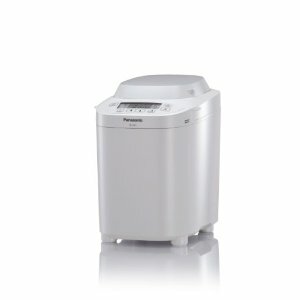 A breadmaker is a machine designed for making bread! It takes the hard work out of making bread. You don't have to worry about mixing the ingredients, kneading the dough, cooking for the correct time or at the right temperature. The bread maker does it for you! 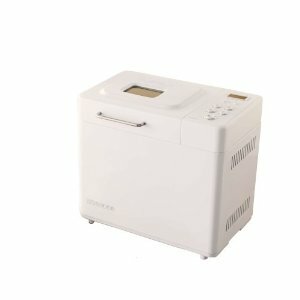 Here I have listed some breadmakers - breadmaker machines available. To make bread using one of these machines is very easy. All you need is to measure out the ingredients, put them into the bread pan in the correct order, close the lid, select the baking programme and choose light, medium and dark crust. Some bread makers have delayed timers giving you the luxury of freshly baked bread for breakfast. Mmmm! The bread maker does the kneading, rising and baking for you. Each breadmaker has a non stick removeable bread pan into which goes a kneading blade. The shape of the bread pan will affect the shape of your loaf. When buying a bread maker consider whether bread shape is important and decide on the size of loaves you want. Some breadmakers have speciality flour cycles for making wholemeal loaves and can also cater for particular dietry requirements e.g. gluten free, low salt, high fibre. Consider which features you need. You should also think of the size of your bread maker and where it's going to go on your kitchen top as some machines can be quite large. This breadmaker has 9 Bread & Dough Modes. Customise bread to suit your dietary needs. 3 Different Loaf Sizes. 100% Gluten Free Bread Mode. "THE BEST KITCHEN TOOL I HAVE EVER BOUGHT. BYE BYE SUPERMARKET BREAD "
11 Bread & Dough Modes. This breadmaker has a Raisin Nut Dispenser. Jam and Compote Mode. 3 Different Loaf Sizes. 100% Gluten Free Bread Mode. "Fantastic breadmaker! 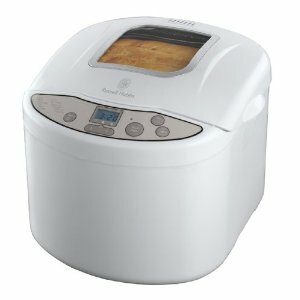 - This is the first bread maker I have owned, but it is exactly what I was hoping it would be! I chose this one, as the reviews for the older version of this machine were really good, but I preferred to get the newest one. " "It was very straight forward to get started. The manual has a good collection of recipes, enough to keep me occupied for the next few weeks." "The bread maker is so simple to use a child could do it." 15 programs and 5 personal program settings. 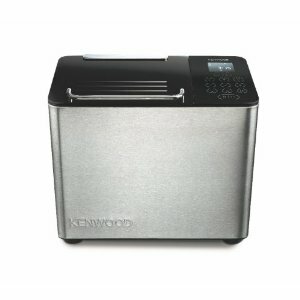 Unique Kenwood non-stick coated bread pan and kneader. * A large dispenser to add nuts or fruit partway through the cycle "
its 55-minute fast-bake function means you can have a nutritional, tasty loaf ready within an hour. 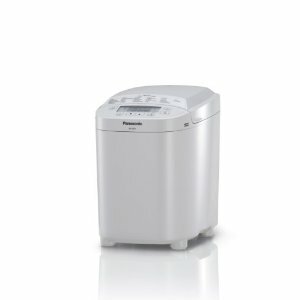 The 12 programmable combinations allow you to bake basic, French, wholewheat, cake, pizza dough and even jam, and the breadmaker comes equipped with an adjustable crust control option based on your preference of a light, medium or dark crust..
" The more you use it - the better it gets!- The first few times I made bread with this machine the brown bread crust turned out a bit pale. But I found the more I used it the more crust colour the bread took on." The aroma of homemade bread around the home is one of those great cooking experiences. Bread, fresh out of the oven, with melting butter is a memorable taste sensation. "It's very easy to clean. The pan just twists out and you can wipe it clean. " specially Good in our case for a Gluten Free and Tasty Loaf"
"I've put this through its paces with a few different loaves now and can confidently say it's a treat. Chuck in the bread mix, a bit of water and choose a preset programme. That's it." 12 hour digital timer with delay option ; Express setting; gluten free, white, granary, whole-wheat and a cake setting. 60 minutes keep warm facility. Great value breadmaker if you're on a budget. Measuring cup provided measures 1 American cup and not British. An excellent machine producing consistently good results. 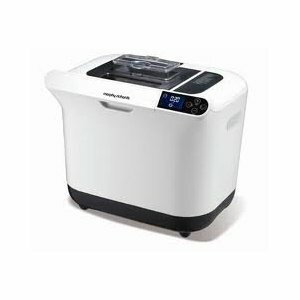 Buy a bread machine and wake up to the lovely smell of fresh cooked bread. Hope you find this page on breadmakers of use. Happy bread making!